Once upon a time, there were these wonderous drinking establishments called "Public Houses" or, as they're more commonly known "pubs". The proprietors of said establishments were known as "publicans". I'm sure that any British readers would scoff at the notion of American "pubs", but there are a few of them worth their salt here in the US. Indeed, they're a growing concern these days. However, it wasn't that long ago that such establishments were a rarity. True publicans of the day were isolated and lonely. But when American beer bar pioneers like David Keene (of SF's Toronado) or Tom Peters and Fergus Carey (of Philly's beloved Monk's Cafe) found out about each other back in the day, they decided to form a group of publicans (I'm leaving a bunch of them out here, there were several other founding members) that would get together for some libations and maybe even collaborate with breweries to make "outrageous" beers. Thus was born the Publican National Committee, or PNC for short. Beer Nerd Details: 13.7% ABV bottled (22 oz bomber). Drank out of a snifter on 11/2/13. 2013 Vintage. Cases: 450. 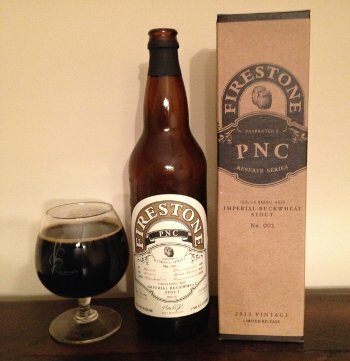 Another delicious barrel aged treat from Firestone Walker. Still waiting for Velvet Merkin to show itself in the area. The hunt is on. Stay tuned. This page contains a single entry by Mark published on November 6, 2013 10:57 PM. La Cabra Brettophile was the previous entry in this blog. Forest & Main Palomino is the next entry in this blog.